Home » Japanese Knotweed » Where is Japanese Knotweed Most Likely to Grow? Japanese knotweed, which can be identified here, is most likely to grow in different places depending on the use of the land you’re concerned about. And, if you are affected by Japanese knotweed, it is right to be concerned and you should explore how to remove it (also, see here for some information on DIY treatment). So just where does Japanese knotweed grow? In domestic gardens it usually establishes itself in a number of ways. These could include vegetative propagules (usually roots/rhizome fragments) in imported soil or compost or the encroachment of growth from an adjacent property. If the adjacent land use is wasteland or is in general disrepair or infrequently managed, then the risk of knotweed appearing there from fly tipping or careless importation of contaminated soil could increase markedly. As a weed, knotweed can appear surprisingly well behaved in a flower bed or planted border when it’s unknowingly kept in check by regularly weeding or through pruning of dense shrubs and mowing of lawns. This can particularly be the case if the knotweed is relatively suppressed by other dense, planted vegetation. It can then show itself in a remarkable fashion when the shrubs or trees that were suppressing it are suddenly cut back or felled. On larger sites, such as commercial land, woodland or open spaces, knotweed can often be located in areas where the land borders other properties or where there is access for vehicles. Car parks and lay-bys are particularly at risk of knotweed infestation as they can be areas where significant amounts of fly tipping occurs. Other common routes of spread are watercourses. In the UK knotweed almost never spreads by seed, but its roots/rhizomes can regenerate very easily from relatively small fragments. These are readily broken from the ‘iceberg’ of rhizome mass in the ground that often belies the much smaller area of aboveground stems. If these fragments find their way into an adjacent watercourse, they can spread downstream for miles, causing new populations of knotweed to emerge at numerous new locations. The management of watercourse banks to keep them free of vegetation, which can impede flows, can often result in the accidental spread of knotweed. In addition to fragments falling into the water, they can be picked up and spread to other sites on workers’ boots and equipment and on the tracks and wheels of clearance machinery. 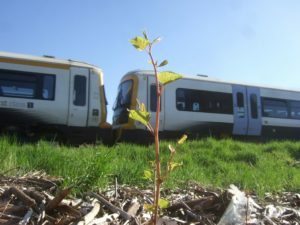 Another commonly reported source of knotweed is railway land. As the railways are linear features with often wide margins of vegetated land that pass through many built up areas, there can be opportunity for fly tipping over fences and for the spread of knotweed along their corridors from the management of vegetation to protect the lines. Knotweed is very common across the UK and from the above you can probably tell it’s mostly associated with the activity of people in urban and rural settlements. As such, you’ll find it somewhere in most cities, towns and villages. However, there are notable geographic hotspots, such as East London, South Wales, Manchester and Cornwall, particularly where industrial activities or development works have contributed to its spread.